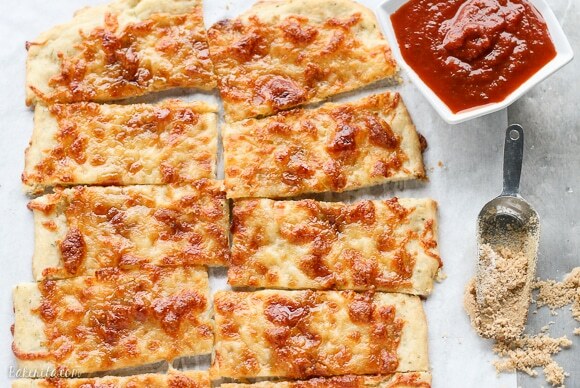 Sweet Sticks were a favorite of my friends and I in college – these bread sticks are topped with melted mozzarella, garlic, and brown sugar for a salty-sweet combo that’s surprisingly irresistible! Sweet sticks bring back some really good memories…sometimes hazy, but always good. Sweet sticks were one of the staples of a night out in college. At my school, there was a pizza place on campus that would stay open until 2 a.m. on the weekends, but they would stop taking pizza orders an hour before closing. Many nights, right before 1 a.m., you could find a group of us calling The Cellar to order a large sweet sticks – “EXTRA sweet!” before heading down there to destroy pizza as only intoxicated college students can. Now – I know how this looks. 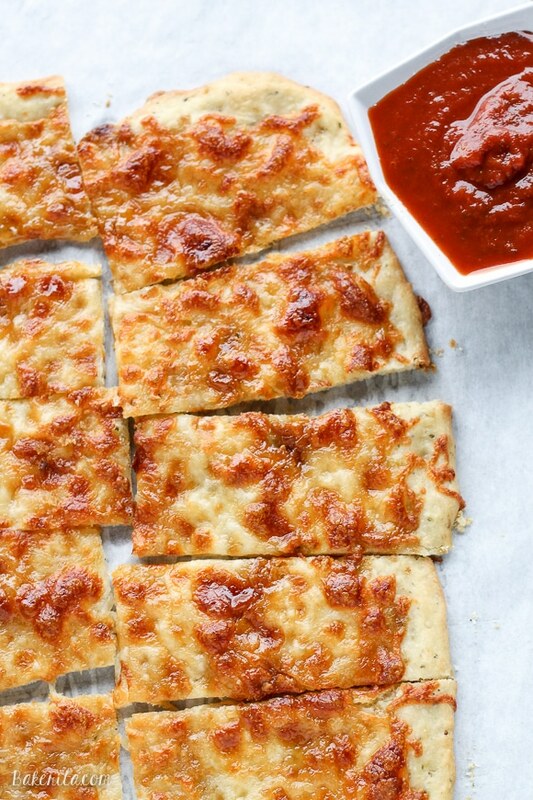 Garlic + brown sugar on cheesy bread? What the what??? And I’m telling you it’s historically drunk food? Hear me out. This stuff is ridiculously good. The Cellar started making sweet sticks after they won some sort of student flavor competition, but that student totally stole the idea from The Rock, which is a pizza place in Washington. They have something called Brown Sugar Mozz Bread on their menu, and it’s essentially what I have here for you today: soft pizza dough, melty mozzarella, fresh garlic, and brown sugar. Now, this recipe is perfect for game-day because it’s totally that kind of cheesy, shareable dish that tastes perfect with a playoff game and a beer. And since no one likes to wake up early on Sunday to start prepping food for the game, you’ll be happy to know that you definitely don’t need to do that for these sticks – the bread dough takes just 10 minutes (!!!) to rise. I first tried Krusteaz flatbread mix way back when I was visiting their headquarters with the rest of the Baker’s Dozen in September. We all made lunch together using Krusteaz products, and my group was in charge of flatbread. We were all amazed by how super easy and delicious the dough was, and topping possibilities are endless. A few weeks later, when my roommate and I had a pizza making night using the Italian Herb Flatbread Mix, we had to try making a rendition of sweet sticks – and they turned out so well, I had to make them again to share with you! 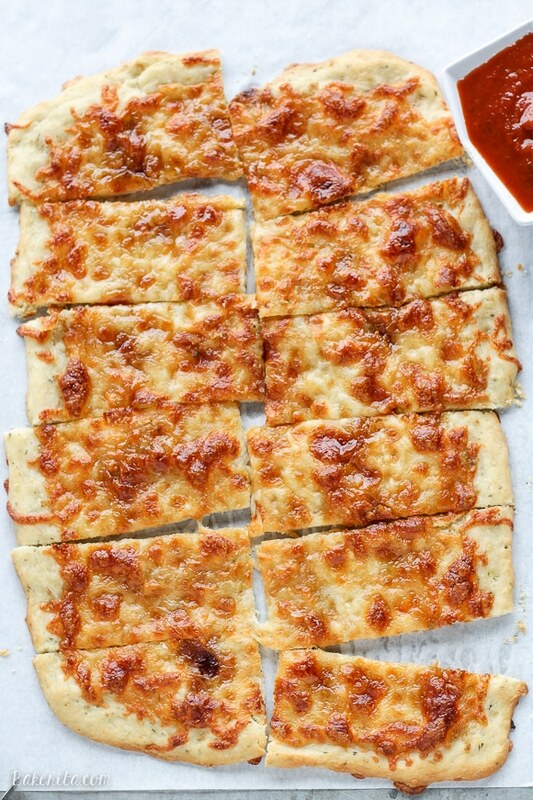 Although the brown sugar sounds weird in theory, it really just creates these little pockets of sweet that somehow work so well with the garlic and cheese. I like dipping the sticks in marinara, so that’s what I went for in the pics, but all my friends prefer eating them with ranch. However you serve them, they’re sure to be devoured. Enjoy! This post is sponsored by Krusteaz. As always, all opinions are my own! Thanks for supporting the brands that support Bakerita. Wow these looks so tasty! The brown sugar does sound so weird but I’m all for weird when it looks like this! I have never eaten anything like this, but it looks delicious! This looks so good! 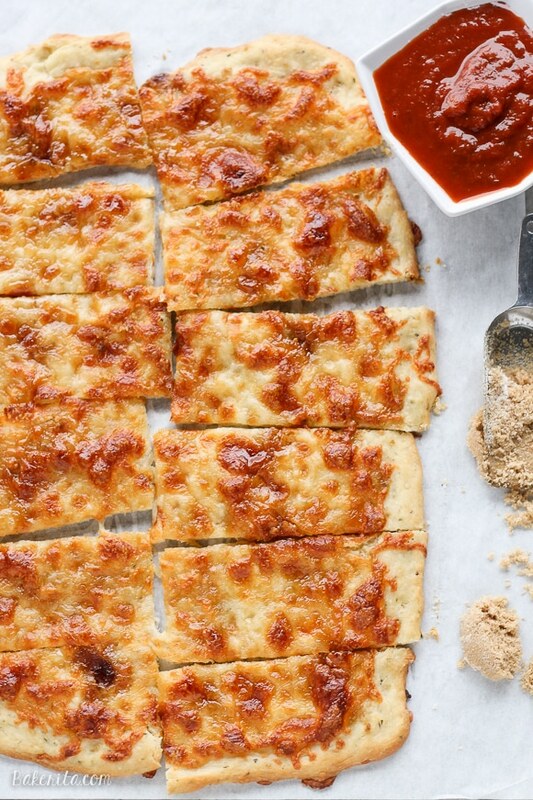 That combination of cheese and brown sugar on that flatbread sounds really addicting! I love how different this is!! I honestly never would have thought to combine cheese with brown sugar. You have peaked my interest and I’m giving this a try! Whoa, I’ve never had anything like these but they look amazing~ I love the brown sugar, so unique! YUM! These look exactly like something I used to order late night in college. I definitely need to try making these at home. Oh this looks SO good, Rachel! It’s lunch time and I’m totally craving these sweet sticks. Love this creative recipe! These look amazing! I follow a blog called “Cooking Mimi”,and she posted a recipe for homemade flat bread recently. Looked so good and was planning on making a batch. Love Krusteaz products, their Belgian waffle mix is pretty good.But totally have too use Michas’flatbread recipe with you recipe. Think I will have to double up it will be so good! Many Thanks! Mmmm you have definitely sparked my interest! These looks SO good, Rachel! Carbs, cheese and brown sugar sound like my kind of treat! I can’t wait to try these! This looks so delicious Rachel! Thanks for sharing! whaaaAAAA???! I’m 11 different kinds of intrigued. I’m totally gonna need to give this a try! You must!! You’re going to love them :) thanks, Kayle!